Obama: Libyan Intervention A "Core Principle That Has To Be Upheld"
"The core principle that has to be upheld here is that when the entire international community, almost unanimously, says that there is a potential humanitarian crisis about to take place, that a leader who has lost his legitimacy decides to turn his military on his own people, that we can't simply stand by with empty words, that we have to take some sort of action. I think it's also important to note that the way that the U.S. took leadership and managed this process ensures international legitimacy and ensures that our partners, members of the international coalition, are bearing the burden of following through on the mission as well. 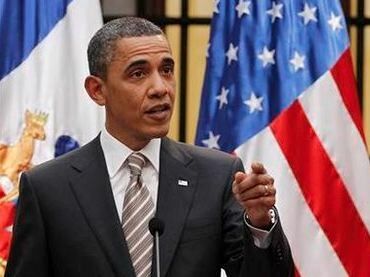 Because, as you know, in the past there have been times when the United States acted unilaterally or did not have full international support, and as a consequence typically it was the United States military that ended up bearing the entire burden," President Obama said about Libya at a press conference in Chile today. Dem Congressman: "We're In Libya Because Of Oil"
Chris Matthews: "American People Deserve To Know Why We're At War"